Shut up! Shut. Up. The art history nerd in me was shining, still is shining. 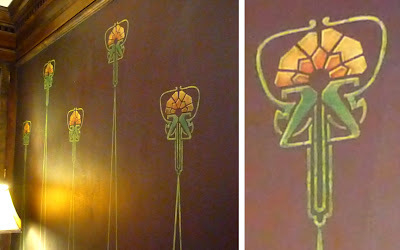 This is pure, classic art nouveau, hand painted at the turn of the century. This is a perfect example of Alphonse Mucha's style, the father of art nouveau (which, coincidentally, I was just discussing fervently not three nights ago), a perfect example from when it was reaching its zenith. The 1900 Universal Exhibition in Paris burst art nouveau onto the world scene. This is when it was happening! There's an utterly dorky smile on my face right now. Over the past few years, I've become a Mucha/art nouveau superfan. I even painted a copy of his 1896 Summer for my dad for Christmas last year. Oh, her look is entirely mischievous. I just want to climb in all his paintings and roll around in them. Actually, that's my response to a lot of things.